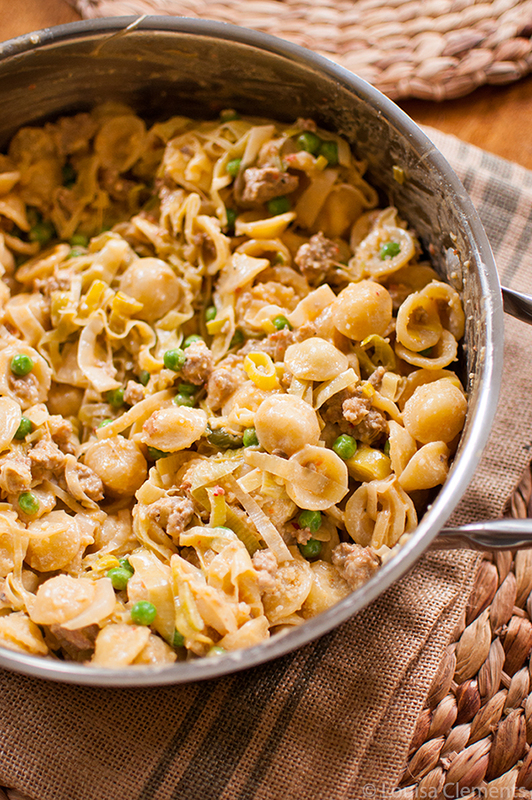 Simple and comforting this sausage and leek pasta is an Italian staple and makes the perfect weeknight supper. Out of all the cuisines featured on One World Kitchen, Italian is the one I am most familiar with. I’ve been on a culinary adventure of sorts with the help of Gusto TV’s new show. First, I learned about Indian food along with Vijaya, then Japanese desserts with Hana. In her episodes focusing on Italian cuisine, host Vanessa Gianfracesco guides us through classic Italian staples, like homemade pasta and focaccia as well as risotto and more pasta sauces than you can imagine. You may think you know everything about Italian food, but Vanessa does not shy away from complicated dishes like porchetta and adds her own twist to each of these recipes. In this week’s episode, “Spiced Up Sauces” she shares three recipes for simple sauces. 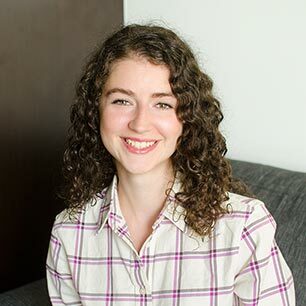 Like the previous hosts, Vanessa brings a great energy to the show and I loved hearing little tidbits of a back-story about her Aunt making these dishes back in Italy. This episode is all about pasta, including an informative section on “Pasta 101” where Vanessa shares a few insider tips on cooking pasta (salting the pasta water isn’t only for seasoning, but it stops the pasta from clumping together). I also love the tips she gives on the different pasta shapes – I’ve never put much thought into which pasta I pair with my sauces, but I will now. The first recipe she shares is a creamy spinach and ricotta sauce served over fussili, followed by a bucatini pasta with seafood sauce looks that to-die for and perfect for a celebratory dinner. 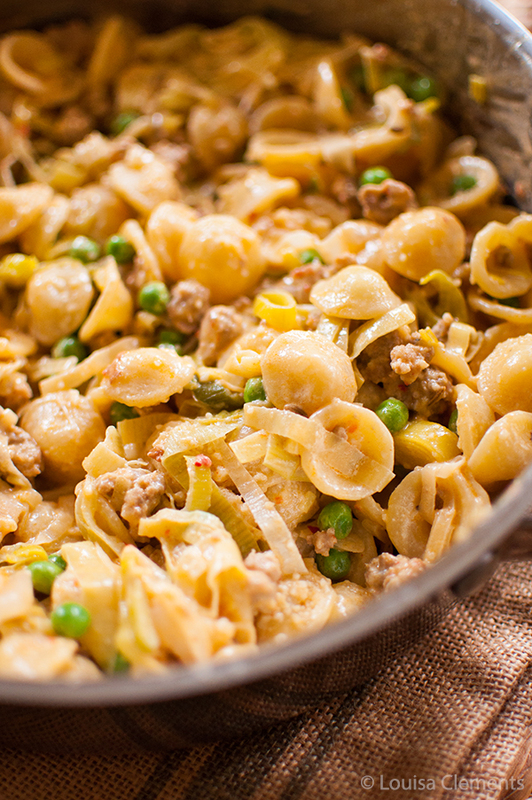 I decided to go with the third sauce, sausage and leeks served over orechiette pasta simply because this little ear-shaped pasta is one of my favourites. 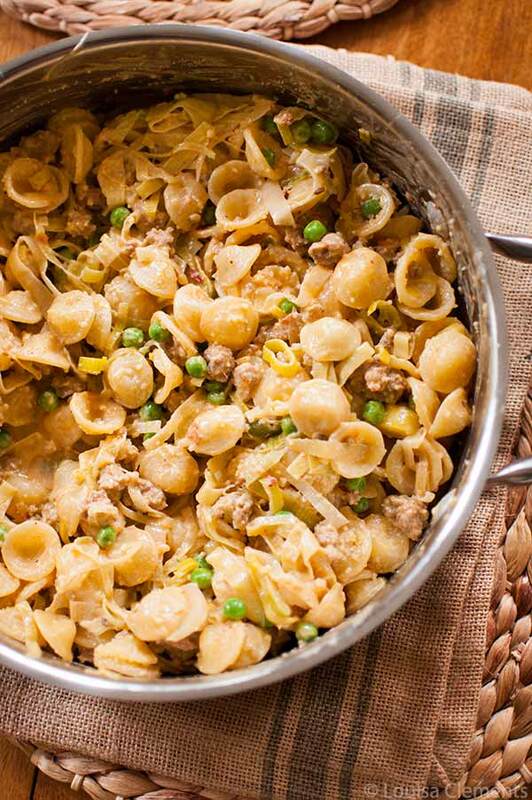 Italian sausage (I used hot instead of mild) and leeks make up this creamy, gravy-like sauce – sausage and leek pasta is an Italian staple. With Dijon for a little kick and the burst of sweet peas to add crunch and brightness, this indulgent pasta is sure to become a family favourite. In a large skillet, heat the olive oil over medium-high heat. Cook the sausage, breaking up any lumps, until it starts to turn golden on one side, about 5 minutes. Add the leeks and cook, stirring, until soft, about 4 minutes. Stir in the shallots and cook for 1 minute. Deglaze with the wine, and add the cream and Dijon. Stir to incorporate, and season with black pepper. Keep warm while pasta is cooking. For the pasta, bring a large pot of cold water to a rolling boil over high heat, and add the salt. Add the orecchiette and cook, stirring occasionally, until al dente. Drain well in a colander. Add the pasta to the sausage and leek sauce, and toss well. Add the peas just to heat through. Remove the pot from the heat, and add the butter and Parmesan; toss well. Season with salt and freshly ground pepper, to taste. Transfer to a warmed serving platter or individual bowls. Serve immediately, with more grated cheese on the side, if you like. Vanessa Gianfrancesco’s recipe from the One World Kitchen series, brought to you by Gusto TV. Republished with permission. Disclosure: This post is sponsored by GustoTV– as always all opinions are my own. Thank you for supporting my sponsors and allowing me to continue creating content! Great recipe, Lou! I really enjoyed cooking a similar dish for my family and they loved it. Next time, I think I'll try making this recipe with some of your modifications. I have a feeling my family is going to love my cooking even more so thank you for sharing!